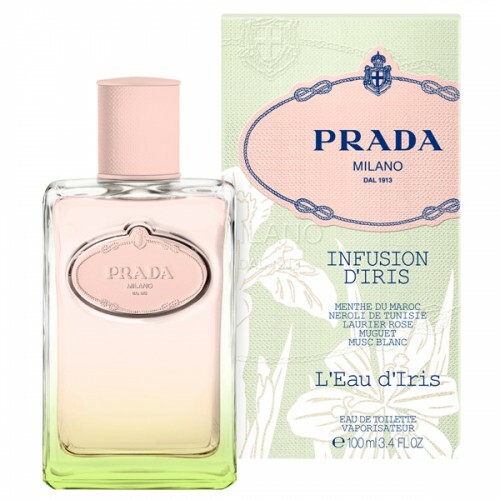 Prada Infusion d'Iris L'Eau d'Iris will be one of your favorite flavors. 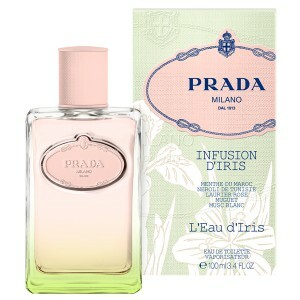 Prada Infusion d'Iris L'Eau d'Iris 100ml. Eau De Toilette - the same ephemeral and unique as the precious ingredient that gave it its name - inspired fragrance Infusion d`Iris search for balance and harmony in a chaotic and contradictory world. The classical tradition in modern sound embodied the luxury fragrance Infusion d'Iris. Its founders dedicate this song to the ancient art of flower extracts, which bears the name of "infusion", a process which lasted for six months. Sophisticated perfume composition built on the union of two opposites: Charming Old expressive and modern. Absolute harmony of two different eras expressed in an extraordinary lightness and freshness of flavor. The line of Art Nouveau created by citrus notes of mandarin, orange blossom and flowers peppered galbanum. Antique luxury woven smoky incense cedar, vetiver, benzoin and incense. Hidden in the heart of iris flowers appear subtle ghostly outlines, making the flavor is very intimate and delicate, like a light whispering in his ear. The fragrance from Prada Infusion d`Iris set designer Daniela Andrei, it uses high-quality natural ingredients, making the aroma of both fresh, clean, easy and delicious. With this perfume you a new look at the iris aromas and creators Infusion d`Iris believe that the notes of vetiver and cedar, which are often used in men's fragrances distinguish their creation from other women's fragrances. The fragrance opens with notes of orange blossom and mandarin, followed by the heart of galbanum, benzoin, incense, vetiver and cedar. Very original and elegant fragrance, Infusion d`Iris produce for you and others a lasting impression and will be one of your favorite flavors.